haha, i guess the picture right at th top now suits th name of yr website more. i love the new banner pic!! I actually have a hello kitty pirate wallet so it makes perfect sense to me and was contemplating on getting a hello kitty tattoo. if i do, i’ll send it over to you just to torture you some more! What the hell is going on with the tooth-clouds around Hello Kitty? I used to love Hello Kitty until I came onto this website. All this Hello Kitty crap makes me want to vomit in terror. And the fact you can have a daily blog about all your Hello Kitty findings is insane. Forget about the ozone layer, or gas prices. . .what can we do about this Hello Kitty crisis!? I like the new “burning Kitty” photo on top, but I also liked the Kitty devil you had on before. I thought that the Kitty devil sent a more active message, i.e. Hello Kitty is evil. She has invaded every part of your life and has constantly tried to make your life more miserable. Whereas the “burning Kitty” sent a more passive message, i.e. you’re burning in Kitty Hell as a result of your own doing… which is true, but it made Hello Kitty sound like an “innocent criminal” instead of the real devil she really is. What’s with the J-list banner ad? I thought you didn’t want to give any info on where to get these items? Or is it just to show how much more weird and awful HK stuff there is? Okay, first off I’m a girl and know what? 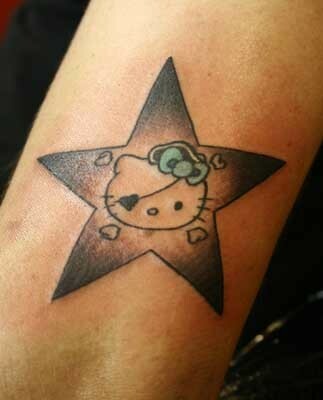 To be fair I hate Hello Kitty, it’s just unnaturally cute. I hate it. Secondly this pirate tattoo? Disgusting. Any girl who wants that or any boy for that matter needs to be sent to a health clinic and seriously get their brain checked. It’s unhealthy for people like HK fanatics to be so obsessed with this stupid fetish. On a better note. I like the new layout of thew site. Really fits it now unlike that gay animation which was still”cute”. Nice one. GREAT tattoo! HK 4 EVER! I think people are missing the point of the new logo. The burning HK represents the hell that is cute overload, and the person is the site owner trapped in HK H*ll. I have a hello kitty Ninja tat.